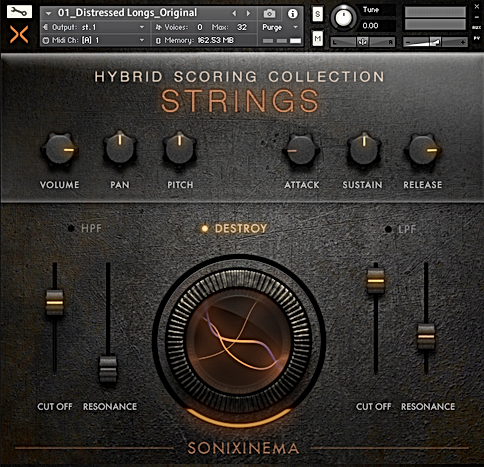 Hybrid Scoring Collection: STRINGS is the first instalment in our new range of instruments for Kontakt. The first of it's kind, this library combines not only orchestral textures but more modern instruments such as guitars, bass, mandolin and a wide range of custom designed effects. ​This inspirational library is perfect for creating lush and delicate textures, as well as mean and gritty cinematic flavours which will bring your music to life. Hybrid Scoring Collection: Strings has a custom designed interface with many parameters for shaping your sound. We wanted to blur the lines between natural instruments and analogue effects to create an inspiring and intuitive way of working. 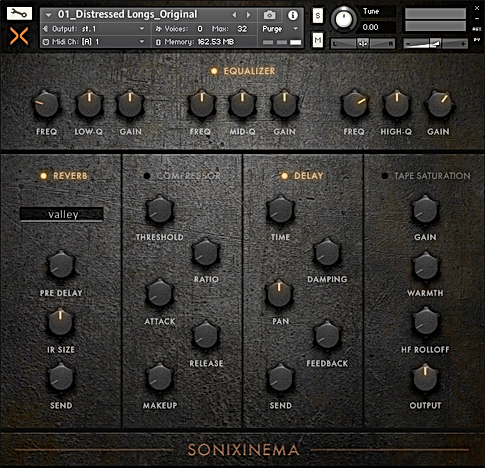 The interface is made up of two sections, the main engine and the effects engine. In the centre of the main tab you will find the DESTROY knob which you can activate by clicking the title and either using your mod wheel or mouse to control it. This adds a deep, gritty distortion to the instrument which is perfect for increasing the intensity of your sound. The main tab also includes parameters for volume, pan, pitch, attack, sustain, release, high pass/low pass filters each with a cut off and resonance knob. The effects tab on the interface contains a three band EQ along with reverb, compression, delay and tape saturation. These effects give you a wide range of possibilities to morph and adjust the sound of the instrument. If you ever want to return to the default settings, simply cntrl (windows) or cmd (mac) click on the knob/slider.